Yes, choose your weapon. I don’t mean knives or guns, but tools for your iPad. Since, I have had my iPad received in May 2010, I have purchased a few different stylus as well as made my own for drawing. I first purchased the “Pogo” Stylus. It is made of lightweight metal with a sponge tip. I enjoyed using the Pogo for quite a while, but I did go through a couple, due to the sponge flattening out. I also found it difficult to see what I was drawing, so it pretty much was a blind drawing. I did get used to it though and learned to compensate for it. I noticed that they have a new pogo called the Pogo Sketch Pro. It looks sturdier and easier to use, but I wonder if it is still difficult to see while drawing. There was a period of time that there weren’t any other types of styluses available to purchase. I did imagine inventing a few of my own. I thought it would be great to have a paintbrush in various sizes and styles. I heard that you could also make your own out of special type sponge, you know the ones that have the green scour pad on one side and the yellow sponge on the other. Apparently the sponge is made of special cellulose that allows it to make a mark on the iPad. You can cut a piece of it and attach it to a pencil. It works somewhat, but it tends to be cumbersome and awkward, but worth a try. The next stylus I tried was a “Dagi” a Capacitive Stylus. I really enjoyed this stylus; the best feature was that it allowed you to see the line created in your drawing, no more blind drawing. Below is a great video showing the “Dagi” being used. Apparently they have changed the “Dagi” recently and have a new model. It looks more like a pen and looks like I might be purchasing this one, as well. It’s called the P602 . My only gripe with the “Dagi” is that I found it not to last only a few months. It would lose its connectivity, thus I would have to purchase another. It was a great tool for fine exact drawing. This caused me to search further for a stronger stylus. In my search for a stylus that could hold up, I found the “BoxWave”, also a Capacitive Stylus. The “BoxWave” has a firm rubber tip that marks easily on the iPad, unlike the “Pogo” , the tip does not move around. It gives you as well a normal writing and drawing angle that allows you to see what you are drawing, while you are drawing. It also has on the other end an ink pen for people who want dual usage. This has probably been the most successful drawing tool to date. Now, in addition to the BoxWave, I purchased a paintbrush stylus, by “Joystickers” called the “Flow”. This is a relatively new company. I had ordered this brush months ago and it did not disappoint. I wouldn’t use it for my only stylus, but I found that it gave my drawings a painterly quality that I didn’t have with the other styluses. 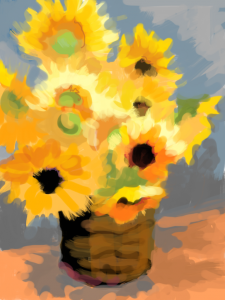 I especially liked using it with the “Brushes” application. The tapered brush is approximately 3/8″ long, 1/4″ wide, including the handle seven and half inches long. The length felt good in the hand and one can imagine you painting, as if on a canvas. It will take me a little time to perfect it, but I felt it is a great compliment to my other tools. Below is my first attempt in using “Flow”. Next week I will talk about the various drawing applications that I use. I hope this is helpful. David Hockney isn’t the only Artist that uses the iPad. Would love your comments. Thank you! please contact me or call (408)460-7237. Thank you! I love your iPad art! You are indeed on the cutting edge, and this post has great information regarding the new tools available. Thanks for blazing the trail! Thanks Shannon for your support. Thanks so much for reviewing the Flow. I’m so glad you like it! That painting is gorgeous. Thanks Anthony, I’m thrilled you like it. This was my first attempt with your product, The Flow, and look forward to experimenting more with it using different drawing applications. I really appreciate you taking the time to visit my blog. You will like the joystickers if you like the idea of using a brush, they work great. I also love the new pogo stylus… great balance and my favorite find to date are the long Ipevo chopsteaks, 2 to a package, Steve Jobs beautiful, I don[t use like chopsticks but more like a paintbrush, on my iProp easel. Painting has never been more fun. BTW great work. You might want to try the Nomad brush. It really gives you the feel of painting. I use that and my old pogo with the tip almost all worn down. I will check it out for sure. 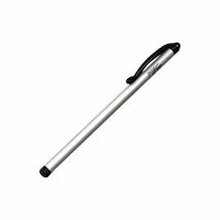 Do you worry about the pogo scratching the screen with the tip is worn down. I love your opinion, thank you. Yes I have the Flow by Joysticker and do love it. How is the visibility using the new pogo? Can you see while you are drawing? And I never heard of Ipevo Chopsteaks not Chopsticks? Sounds very cool. I appreciate your suggestions. Chopsteaks here, aren’t they pretty. https://www.ipevo.com/ the more I use these the more I like them and like the new pogo you can hold them at any angle, like you would charcoal as opposed to a brush. I do like the joysticker and admit I gave away my original Nomad, hated it, I think the bristles were too long, joysticker feels like a real brush but honestly the brush effect is lost on me, it’s a slab of glass! The funny thing is I must use a stylus, my drawing finger is erratic, go figure that out! LOL! AND I am not knocking the nomad, I hear the newer versions are great. Yes, thanks Suzi for the examples, they are very nice. You brought up a good point about the tools complimenting your style. I have tried the Nomad, but heard others love it. So far I am really enjoying the Flow. I do love the texture and of course the flow it gives to the art. Love your comments and you make me want to purchase a set of Chopstakes (going to have to check the spelling lol) Thanks Suzi for coming backand sharing.